Sue Ellis - St Columba Presbyterian Church@Botany. Are you getting stressed booking activities for your next event ? ROCKUP can give you helpful hints and ideas to make your job easier. ROCKUP activities are sure to draw a crowd & keep them entertained. Great spectator attractions with something for the whole family. 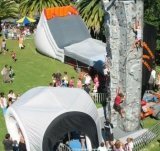 Largest supplier of mobile rock climbing walls in Australasia, Vertical Bungy Trampolines and wide range of bright & colourful Bouncy Castles & Inflatables with slides, dunking tanks, surfboard machines with PA, Inflatable shelters & lots more ... ROCKUP guarantees to add the WOW factor! Do you want to take the hassle out of organizing your next school camp or activity day ? ROCKUP delivers activities to your school or camp venue 30 + activities including Top Team Days. Would you like the opportunity to offer your team fun experiential training days to generate & encourage the development of relationships on all levels ? Would you like to know that the equipment you are hiring and paying for is clean, bright & colorful and going to be delivered on-time ? ROCKUP is a NZ owner & operated business who takes pride in delivering unique, clean, quality equipment always setup ready to go on-time, every time ! Speed rock climbing is the world's latest adrenalin sport. 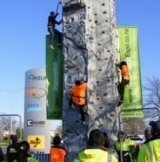 Great spectator attraction for events, corporate team or inter school competition events ... get the adrenalin pumping! © 2010 ROCKUP NORTH Ltd. All rights reserved.